This one is already a big hit with her, and I enjoyed one this morning with a cup of coffee. It tasted like I was eating a sinfully delicious pastry or donut, but instead it's packed with protein and Vitamin E from the SunButter along with the yumminess of bananas which are heart-healthy and a great source of potassium. They're also gluten and nut free, of course! Preheat oven to 350 degrees and line 12 standard muffin cups with paper liners or spray well with non-stick cooking spray. In a large mixing bowl whisk together the eggs, sugar, applesauce, vanilla, and Sunbutter until well combined and smooth. Add the flour, baking powder and salt and whisk together. Stir in the mashed bananas. Divide the mixture between the prepared muffin cups and bake for 25 – 30 minutes. Our batch yielded 14 muffins. While our muffins were in the oven we prepared this mixture, that way we could return the glaze to the refrigerator after mixing to let it "thicken" and have an easier consistency to work with. In a medium size bowl begin whip the cream cheese and grape jam together until smooth. Next time I will probably blend it in the blender rather than whipping by hand in order to get it completely smooth, but Little Miss was rather fond of the pops of jelly and color it gave them. 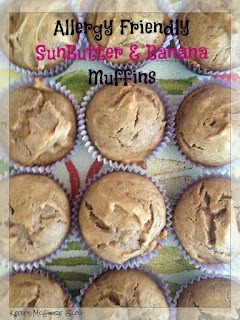 Cover and store in refrigerator until baked muffins are completely cool and you're ready to glaze. After muffins have cooled, I spooned glaze into a ziploc bag and snipped the corner off so we could spread over the muffins. Little Miss had fun helping do this part, lol, so some aren't perfect but who cares! 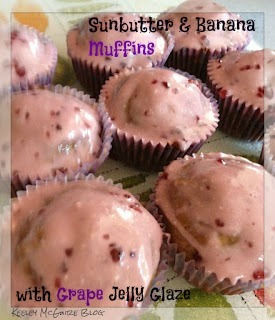 Store glazed muffins in an airtight container in the refrigerator. Nothing I love more than coming up with yummy new ways to make her 'treats'!